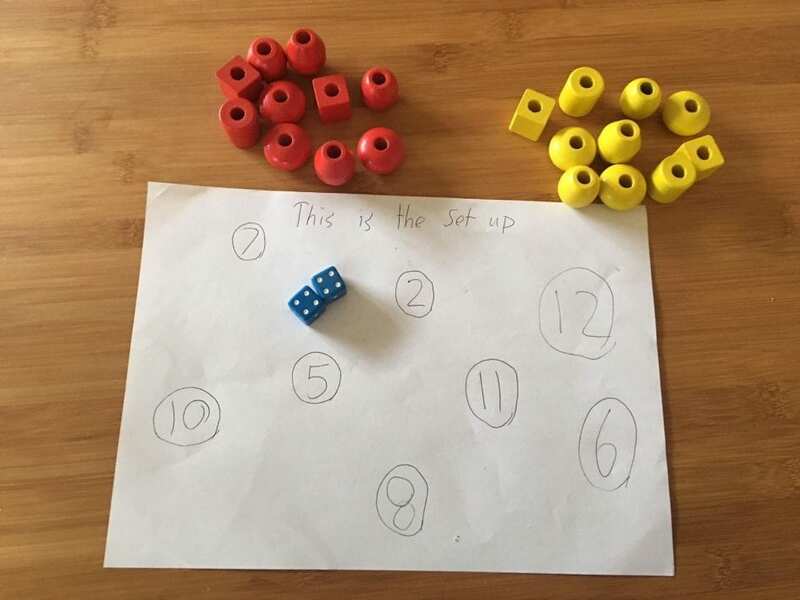 William and his family love playing ‘Addition Bump’ when they have a spare moment at home. Read on to find out how to play this fun and competitive game, featured on our 74 Fun Things To Do Out Of School list. Write a range of about 7-10 numbers on your sheet spaced out, as picture here. The largest number must not be larger than the sum of the 2 largest numbers on the dice (with 6-sided dice this will be 12). Give each player 10 counters (any number of people can play). Players takes turns to roll the dice and add up the numbers. If you score a total that is on the sheet, put one of your 10 counters on the number. If the total is not on your sheet it is the next person’s turn. If someone else gets the same total they can “bump” your counter off the sheet. If you get the same total twice you can stack a second counter on top of your first one. This means you can’t be “bumped” off. The winner is the person who places all of their counters on the sheet first. You can do the same thing in Multiplication Bump, except you multiply your 2 numbers. Thank you Mr. O’Connor for teaching us this game.